Sorry Sadhguru, I humbly disagree with you! Don’t be waylaid by religion, tradition or rituals. Just celebrate yourself and go do what you want to do – as long as it makes you happy! Women in Maharashtra have raised the demand of wanting to enter the Shani temple in Shani Shingnapur – which currently does not allow women inside its sanctum sanctorum or chauthara. Even as the issue is being hotly debated, Sadhguru Jaggi Vasudev’s elaborate – and what some people call ‘brilliant’ – explanation on why women should indeed be disallowed from entering certain shrines, is doing the rounds on social media. 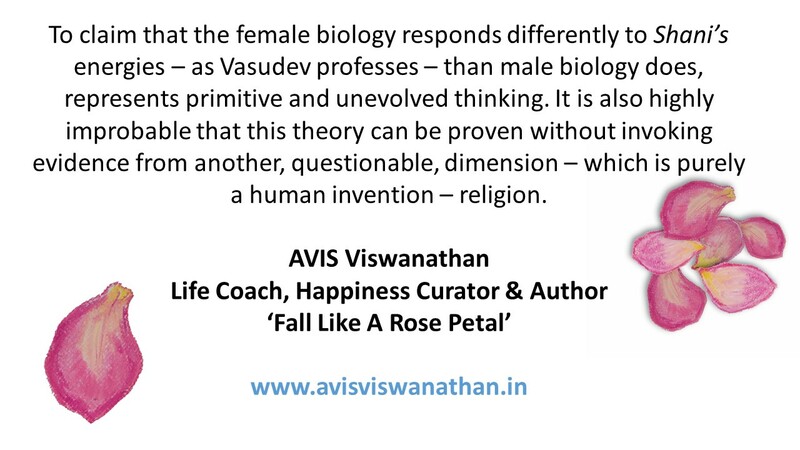 Vasudev’s premise – available here – is that certain temples have consecrated energies that are likely to have a detrimental effect on women; he explains that it is a biological thing and since ‘in the very nature of female biology, occult forces can have a deeper impact on their system’, women should not be exposed to such places. I find all this drama totally avoidable. At a very basic level, as we of course know, there are men and there are women. And there is a higher, inscrutable, energy that shapes our ends. Some call it divinity. I call it energy. Yes, there is a science behind planetary influences on people, places, events and things. But that science and its understanding are beyond the grasp of a majority of us. More often than not we ordinary folks are being misled in the name of tradition, religion, the occult, superstition and rituals. Even if there are influences of a particular planet – the one in question here is Shani or Saturn – on someone or some place, so be it. Isn’t it always what it is? To claim that the female biology responds differently to Shani’senergies – as Vasudev professes – than male biology does, represents primitive and unevolved thinking. It is also highly improbable that this theory can be proven without invoking evidence from another, questionable, dimension – which is purely a human invention – religion. I believe it is time to drop all this human-made diversity and resolve all this confusion that confounds our co-existence. Let’s learn to simplify our lives and unify humanity in the process. The best way to live is to celebrate who you are. Male. Female. Whoever you are, just celebrate yourself. After all, the Life-giving source – the breath that you and I take and what keeps us alive – is the same. For the same reasons, religion is totally avoidable. It is unnecessary in fact. Yes, there’s a higher energy that governs all of us. It is both the creator and the destroyer. But such is Life’s nature – where there is birth, death will follow. So, as part of celebrating yourself, if you want to go some place to celebrate that higher energy (if you believe the energy is location-specific) – Shani Shingapur, Sabarimalai, Mecca, Vatican, wherever – simply go. Don’t get waylaid by people who tell you what religion dictates or what rituals demand or what their understanding of planetary influences is. Do what you must. Just be sure to be happy doing what you are doing. Nothing else – no one else – really matters! Author AVIS ViswanathanPosted on February 7, 2016 March 14, 2016 Categories Art of Living, Celebrate Yourself, Happiness, http://schemas.google.com/blogger/2008/kind#post, Inner Peace, Intelligent Living, Isha Yoga, Religion, Sadhguru Jaggi Vasudev, Shani ShingnapurLeave a comment on Sorry Sadhguru, I humbly disagree with you!